With the love for poor children who live far away from their school, teachers in a primary school in Dak Glei Town in the Highlands province of Kon Tum cook free meals for their students everyday. From September, 2018, the primary teaching staff have provided free meals for ethnic minority in distant Long Nan village. Before the lunch everyday in the school lobby, the teachers and parents run their foot off to prepare the meals and divided into portions for children. Amongst them is Ms. Y Na Trang whose son is studying in the school. She said she and her husband have to work in the far paddy field while their son study in the morning and in the afternoon, therefore, the child has no food for the lunch. She was delighted at hearing about free lunch for pupils, adding that her son gave good comment on the lunch. She lends a hand to the teachers in preparing the meals three time a month. She expected the school will maintain the lunch for children because it is good deed. 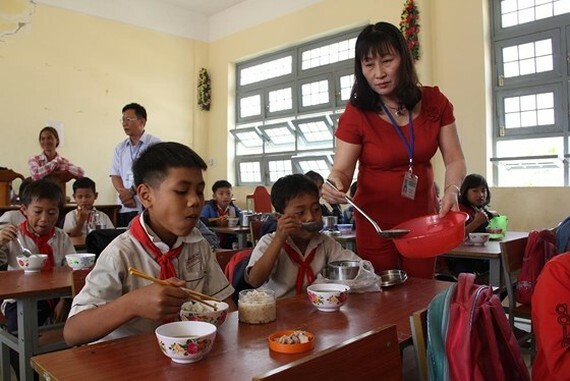 School principal Tran Xuan Ninh said because of difficulties in traveling from students’ houses to the school in a long distance after the school moved to new location, many students just go to school in the morning and quit class in the afternoon. Teachers have to trek to pick them back to the school. To prevent students from staying at home during the afternoon classes, teachers thought of free meals for 46 students of Long Nan village though teachers will have to contribute money and it will bring more difficulties and take more time for the teachers. It goes without saying that parents were so jubilant at the news. At first, the teachers contributed their money to the free meals but later, parents lent their hand to cook meals and raise fund for the meal. The school’s Parent Association has assigned some parents to help the teachers cooking the lunch and looking after the children. Since lunch has been given, students have not quit class in the afternoon any longer. This is a motive power for teachers to maintain the lunch, said teacher Ninh. Deputy Chairman of Dak Glei District People’s Committee A Phuong lauded the school’s deed.